But it is not the case at all. Good friend of the Financial Services Club David Birch has written a whole blog update on the subject, and notes that it’s the Point-of-Sale (POS) software that is key, not the device or payment instrument you are using. The POS makes the difference between whether you are limited to low value or high value payments. The low value limit is when there’s no verification involved or, rather, no Cardholder Verification Mechanism (CVM). 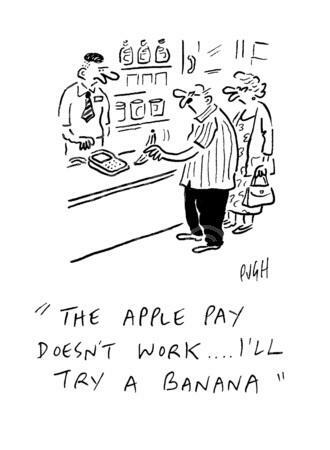 That is not the case with Apple Pay however, as Apple Pay is based upon a biometric Touch ID. In this case there is an additional layer of consumer identification based upon the device and an additional recognition layer, in this case your fingerprint. This method is therefore based upon a Consumer Device Cardholder Verification Method (CDCVM) rather than no verification. This is the reason you can have high value payments with CDCVM but are limited to low value when you lack this device authentication. That’s not only incredibly friendly, but also capable of being used as a CDCVM checkout. Then there’s Android Pay, the Google upgrade to Google Wallet to compete with Apple and Samsung. Some claim Android Pay has advantages over Apple and Samsung by being integrated with loyalty programs, such as MyCokeRewards; it’s contactless payment system doesn’t require a fingerprint or other authentication (although that defeats the high value payment option); and Android phones are far more plentiful in choice from the Samsung Galaxy S4 to the HTC One M7 to the LG G2 to the original Moto X and Nexus 5. All in all, it’s getting really interesting so thanks to CNN for this infographic, which also includes PayPal and Bitcoin to see the range of options now available (doubleclick image to enlarge). It really is a mobile wallet world (at last).